Nearly two years ago, Toronto’s Maegan Fidelino, a graphic designer by trade, started Ephemera Magazine, a new print publication that explores change through a collection of short fiction, essays, photography and artwork. 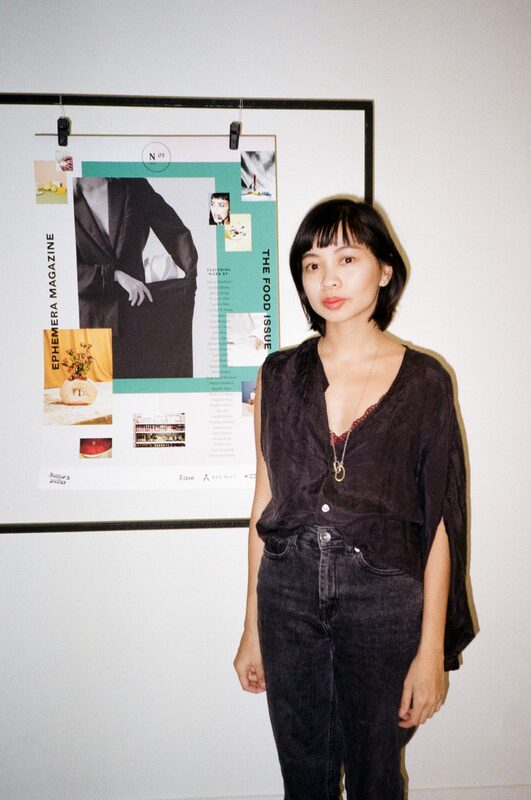 Maegan remains the Founding Editor and Creative Director of Ephemera, while also freelancing, fulfilling personal projects, curating a beautiful Instagram feed and sharing fashion and retail brand stories through visual art. We connected with Maegan to learn about the path she has taken to build her personal and professional brands, the impact of internships – with or without a post-secondary education – and making work that leads to growth, built experience and a resume that doesn’t settle. If you could describe the Ephemera brand and vision in 280 characters (a tweet! ), what would you say? Ephemera is a print publication that explores the idea of permanence and what exactly that means in a world moving at a rapid pace. In relation to a select theme, in each issue, writers, artists, and photographers – new and emerging – dissect ephemerality and its many nuances. What’s the inspiration behind Ephemera? At its crux, Ephemera was inspired by being a print lover at a time that is becoming increasingly digital and the idea that many moments and items that people find important and significant may not last forever, in a tangible way. As an example, the inaugural issue focused on pop music. This really stemmed from visiting a friend in another city and singing along to early 2000s pop songs in his car—while the songs aren’t culturally relevant anymore, they still resonated with us years later. You’re a graphic designer based in Toronto, as well. What about that city inspires you to create? Toronto is a fairly large city, but I find that its creative community is quite small; it’s very interconnected. It’s always cool to see all the interesting and innovative projects coming out of Toronto. Sophomore Mag [a feminist media brand] does really great, inclusive work, and I love that not only do they embrace longform, but their content is always super smart and creative. Did you always know that you’d get into a creative field? Why or why not? I think I did, but didn’t necessarily know what it would or could look like. As a kid, I was a voracious reader and a strong writer, so I thought I’d step more into that field, but now, I think that’s manifested more in storytelling—visual in terms of my design work—in tandem with problem-solving. You graduated from York University and Sheridan College’s joint Design and Visual Communications program in 2011. What have you learned now, having been in the field for seven years, that you wish you knew while in school? I’m not sure if it’s still the case, but when I was in school, it seemed like the only option afterwards was to find a junior position at an agency or studio, and I really wish I knew that a path after finishing school isn’t always straightforward. Since it’s applicable to everything, there are many directions a career in design can go! What advice do you have for post-secondary students who are passionate about design and creative direction, but are maybe unsure of where to make their next move? It’s not always easy, but I would say to create work for yourself, or work you wish existed. Try things and explore different interests—there’s a good chance that these things will help to inform your perspective and therefore your creative practice. For a year or so, my friend and I were sending out an infrequent email newsletter as a means of trying to write more. It was a really fun project and I learned that I was really interested in editing voices and helping others build on their ideas. What advice do you have for someone who won’t be pursuing formal post-secondary education in design, but is interested in that realm of work? Where or to whom would you point them? I would definitely encourage someone interested in design to learn the basics first. Composition, colour, typography and how they all work together. Find work you like and figure out what you like about it. Grow your own perspective and taste within design. Photo courtesy of: Maegan Fidelino. You also do freelance work for Easy Tiger Goods as the Branding and E-Commerce Manager. You’ve had the chance to work with typography and curate some beautiful social media content, as well. What has been the most exciting, but perhaps also most challenging, part of your work with Easy Tiger Goods? The most exciting aspect of my work with Easy Tiger is probably keeping things fresh, especially in an oversaturated social media climate. It’s a small independent business, so the budget isn’t always there, but that often forces me to be more nimble and creative than I would be working for a large company. Before you started with Easy Tiger Goods, you freelanced with Holt Renfrew, Today’s Parent, Flare Magazine and Cosmetics Magazine, to name of few. What was the “hustle” like when trying to land gigs with these major companies and publications? I’ve landed most of my major freelance contracts through a recruitment agency, luckily, so I haven’t had to personally apply or pitch for work very often. Instead, it’s been about building my portfolio with work I can really speak to and feel confident in. You’ve also completed numerous internships and spent nearly four years working in fashion and retail. Being where you are now career-wise, how do you think your internship and retail experience have influenced the person you are and the brand you have, today? The position I’m in now has without a doubt been a progression of all my past experiences. Coming out of school, I was very interested in working in the world of fashion and editorial, and these have been major influences throughout my career. My first job out of school was working as the Creative Communications Director for a small Canadian footwear company. My interest in fashion combined with retail experience made a lot of sense for the role. Since that job was formative for my portfolio, much of my work has continued to be in the realm of fashion retail and editorial, and as such, most of my clients remain in this world, too! Sometimes, when an employer is looking for someone to fill a creative role on a team, the hiring manager may discount retail experience, because it’s not exactly related (well it is, but on paper it might not be). What problems do you see with this method of thinking? How do you hope your success in creative direction and graphic design debunks this myth and persuades the conversation to change? I’m a firm believer in process, and that all experience informs the end result. I think much of my strong work ethic has basis working in a very fast-paced retail environment. It’s important for hiring managers to step back and look at the big picture and someone’s potential, instead of hiring based on technical skills alone. I hope my [journey] is proof that one’s career path doesn’t have to be linear. Let’s talk about your website and online portfolio for a minute! It’s simple, easy to follow and so visually appealing. What platform have you created this site on? What tips do you have for a young professional looking to start their own online collection of work and experiences? Thank you! I use myportfolio.com, which comes with my Adobe Creative Cloud subscription. It’s incredibly simple to use. When I graduated from school, there were far less options for making a portfolio, and it usually involved a lot of complicated hand-coding. Thankfully, now, it’s much easier to showcase work without having technical coding skills. I would tell a young professional to just go for it and put their work out there, be it through Instagram, Behance or a personal website. You must exhaust so much creative and emotional energy during your “workday” (I use this term loosely! Work never really ends!) and then again when you work on Ephemera. What steps do you take when you need to re-charge and decompress? I really enjoy meeting with a friend for a good dinner and a couple of drinks, or just going to a restaurant alone and reading a book. I’m very much an introvert, so I like taking time for myself to recharge. Having slow mornings. Hanging out in bed. Watching some Netflix, mindlessly. Biking in the summer. It’s trendy and chic to talk about the creative process being this glamorous and exciting thing, but it doesn’t always look that way and for each creator, the process is different. How would you describe your creative process? I like to begin by looking at things that inspire me, and creating a visual moodboard in order to get a better idea of how something should feel. From there comes the hard part—actually starting to design. Starting is always, always the [most challenging] part…but eventually, after plenty of experimentation, I’ll arrive at something I’m satisfied with. I’m my own worst critic, so I’m rarely completely happy with my work, but I’m working on it. What do you think the year ahead looks like for you? That’s a great question because I’m not sure myself. I’m currently working on the new issue of Ephemera, out sometime in May. I’m also finalizing scheduling and terms with a potential freelance client; it’s a company that’s working in a very new space, and I like the idea of telling a story from the ground up. So, hopefully, in the year ahead, I will continue to grow as a designer and as a person, and [keep] learning. Maegan, thanks for sharing your story with A Quarter Young! We can’t wait to experience the art you will continue to produce, showcasing growth, lessons learned and your passion for moodboards. To learn more about Maegan’s work and creative inspiration, see Kastor and Pollux, the creative agency that publishes Ephemera. On the company’s website, Leah Lalich, Ephemera contributor, journalist, producer and visual storyteller, wrote a profile to accompany the publication’s launch. Read it now and follow along. The feature photo is by Dani Roche.